Happy Friday, friends! 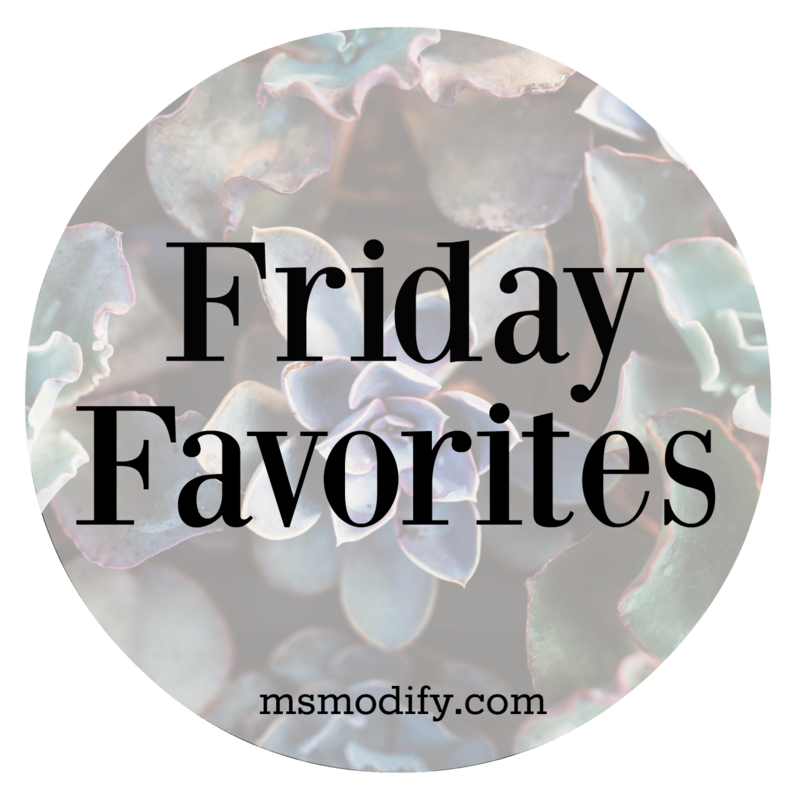 I haven’t done a Friday Favorites in a while, and they’re always some of my favorite posts since I get to share a little more in depth about my life and favorite things. Sometimes I like to have a theme to these posts and other times I like to share random things I love that I think you’ll enjoy too! Can you believe we’re almost two weeks into 2018?! It already seems like it’s going by fast. With that being said, today I thought I would get a little personal and share with you how I’m kicking off the year with a new routine for my life. 2017 had great moments for me, but in all honesty, it also had some really hard, stressful moments for me too. Every year I sit down and make goals for my life… some of them stick, others don’t. 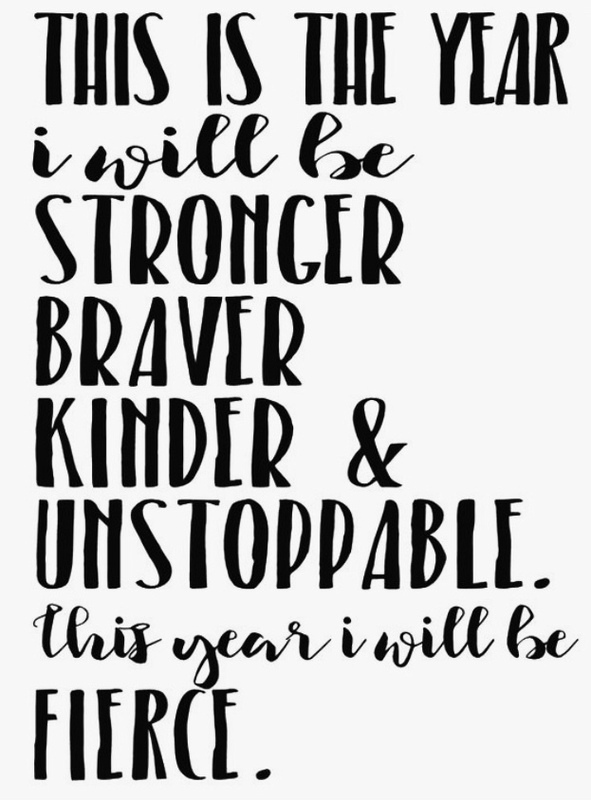 This year rather than making “goals”, I’ve decided to really focus on changing certain aspects of my life and commit to having those become a part of who I am and who I want/need to be. The biggest thing for me is stress. If you’ve been following along for a while, then you know I’ve shared many times that stress is an area I struggle with. I’m a type-A, perfectionist, over-thinker, over-planner type of girl… and I’ve finally decided it’s unhealthy for me. I’m committing time every day to work on me and live my life with more intention. 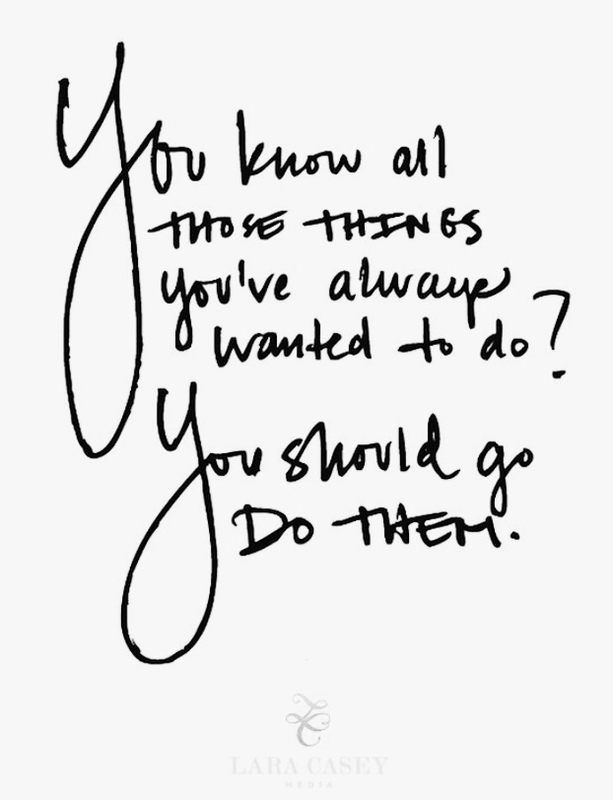 On Pinterest, I have a “Words to Live By” board, and this quote definitely resonated with me! 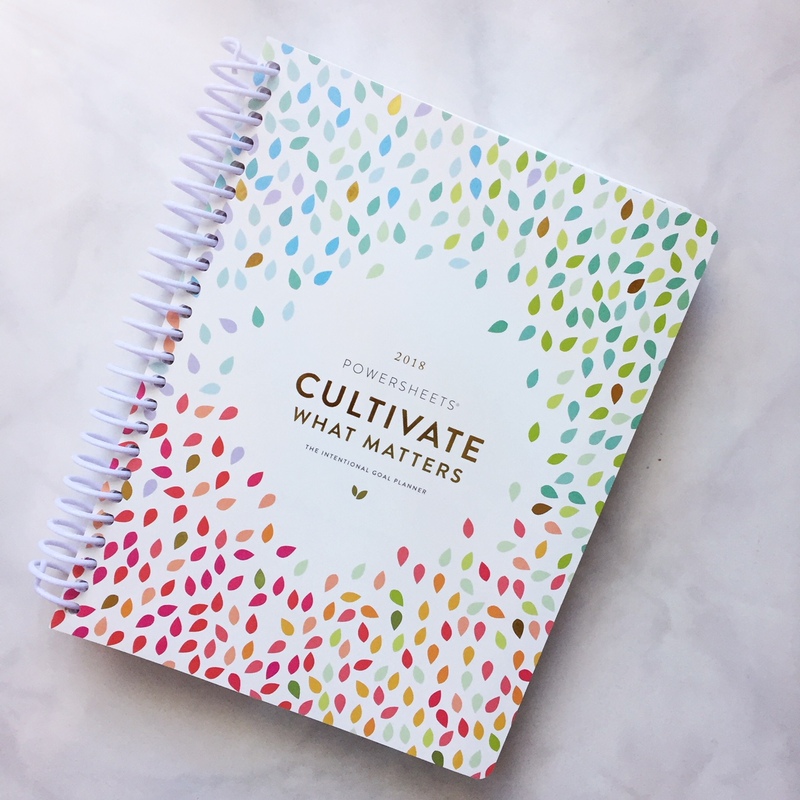 If you follow me on Instagram, you saw that I posted a pic of my 2018 PowerSheets Cultivate What Matters Life Planner and so far I’m loving it! I sat down January 2nd and spent time working on it; really reflecting on who I am as a person, every area of my life, and areas I want to change. The PowerSheets break down different areas to reflect on including fears, what matters most, good things in your life, challenges, lessons learned, the big picture and then goals for the year. Under each month’s tab, it helps you break down your yearly goals into monthly, weekly and daily. Each day you check in and “tend” to your lists and evaluate yourself, and then at the end of the month, you reflect on your progress. The creator of the PowerSheets is one of my favorite authors, Lara Casey. If you’re looking for a little motivation and nudge in life, you have to read her book Make it Happen! During the week Erik and I wake up at 5:30 every day and go to the gym. This is something that helps me tremendously with stress/anxiety. Although some mornings I’d rather sleep, I NEVER regret working out. It’s become a part of my life and I actually look forward to it. In the past when we’d get back from the gym and after Erik left for work, I would linger around checking emails, drinking coffee, with the news on, having social media distract me (I work from home). Not anymore, friends! Since January 2nd I have created a morning routine and it already has made such a HUGE difference in my life. 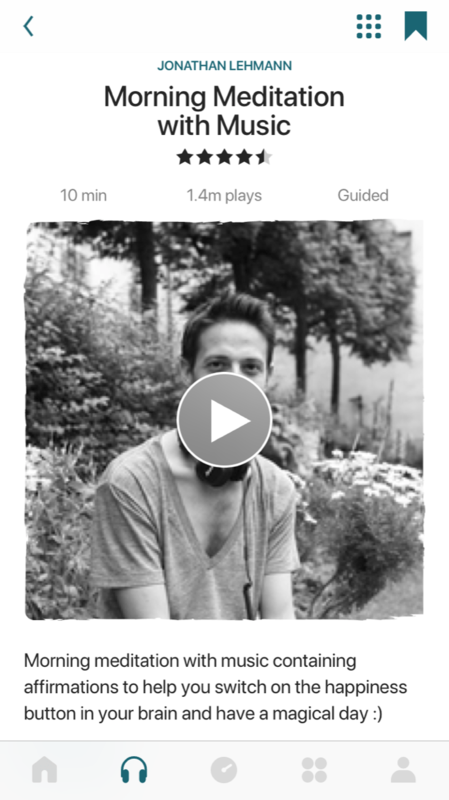 It’s a guided meditation and only 10 minutes! I’ll admit, the first week was a little hard for me to stay present because my mind would wander thinking of everything I had to get done that day. But, I’ve been making a conscious effort to focus on my breathing and staying in the moment… and this week it’s been SO good! After I meditate for 10 minutes, I’ve been doing a daily devotional. Religion is something I’ve always had in my life, but it seems like I’ve drifted from it at times. It hit me this past year that I seem to pray more and “need” religion in hard times, and that’s not how I want to live my life. This is the book I’ve been reading. My mom actually bought me this when I was first diagnosed with celiac and was struggling accepting it. In the inside cover, she wrote a sweet message about facing difficult times. 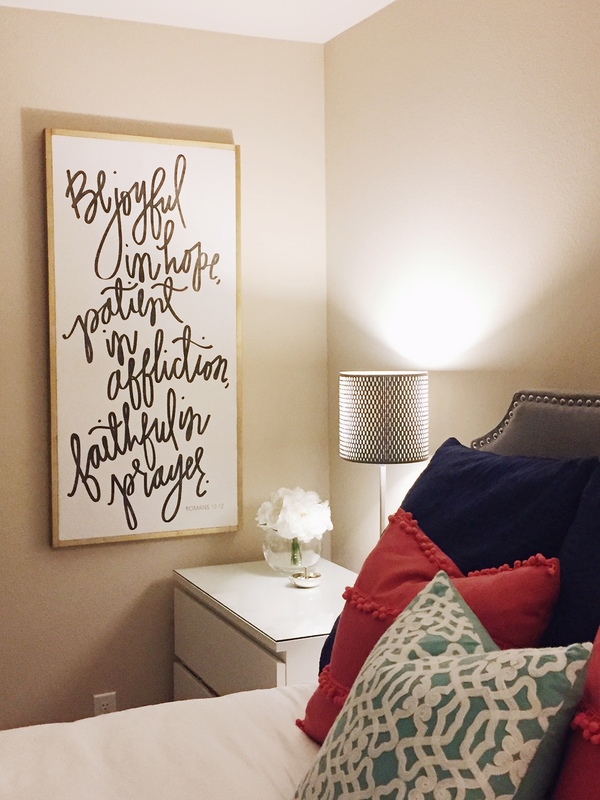 It’s kind of a nice reminder seeing her words each morning as I read it. 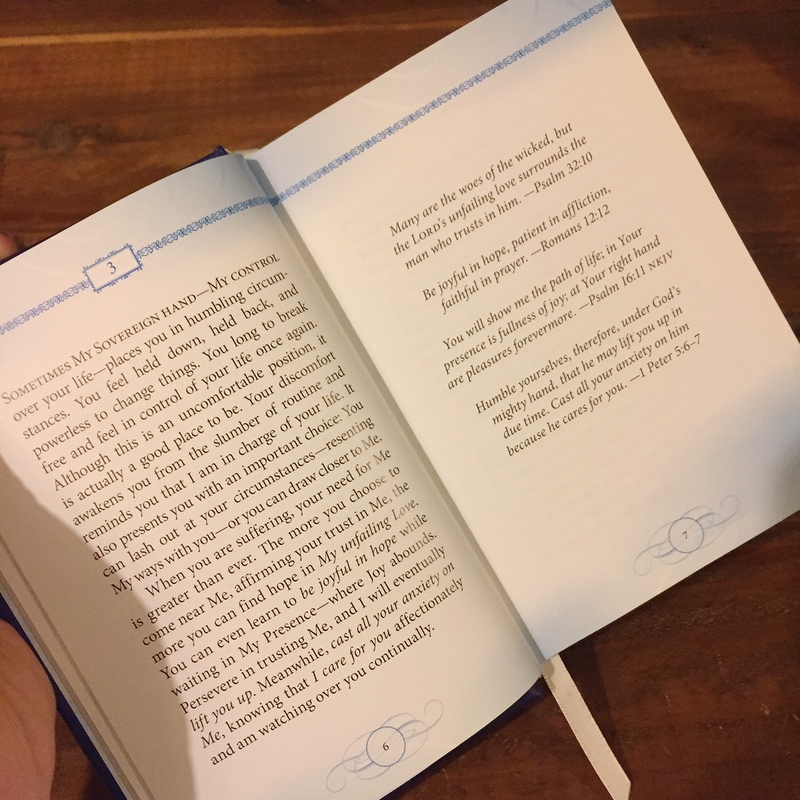 Each morning I’ve just been reading two pages: a devotional entry and the scriptures associated with it. This particular page stood out to me right away because Romans 12:12 is one of my favorite verses. In fact, it’s hanging in our bedroom! 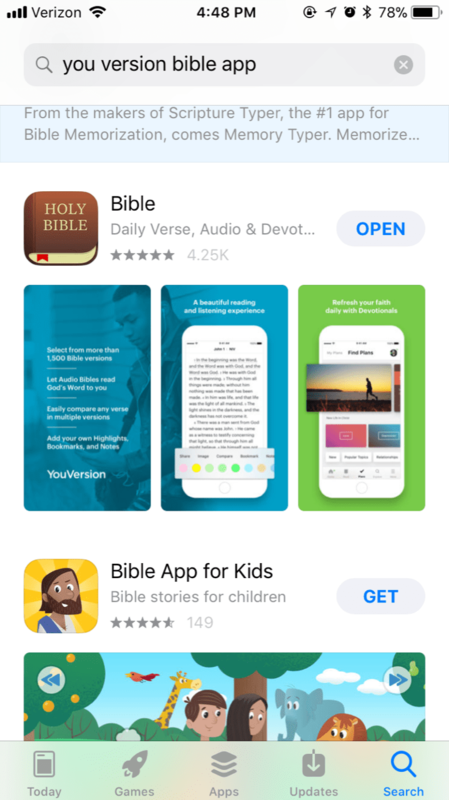 I also downloaded the You Version Bible app (it’s free). There is so much you can do with it and go at your own pace. You can create your own custom plan based on different themes. 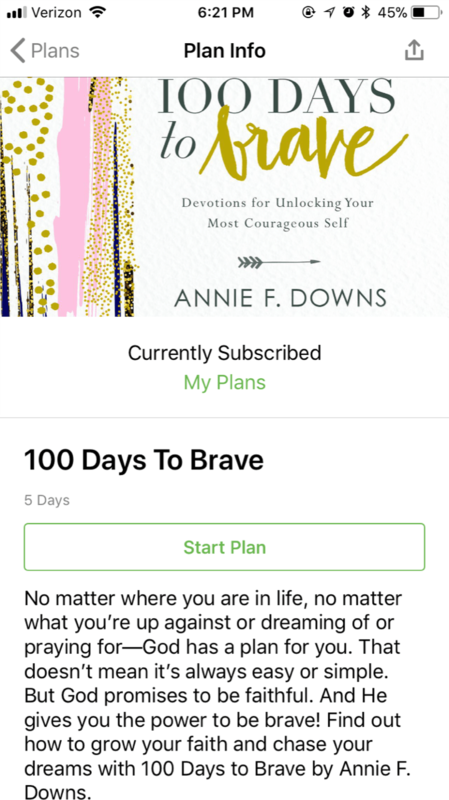 I’ve been doing the plan for 100 Days To Brave. I’m a big fan of Annie Downs and her book Let’s All Be Brave is one of my favorites! It only takes a couple minutes to read, yet is already having a big impact on me. 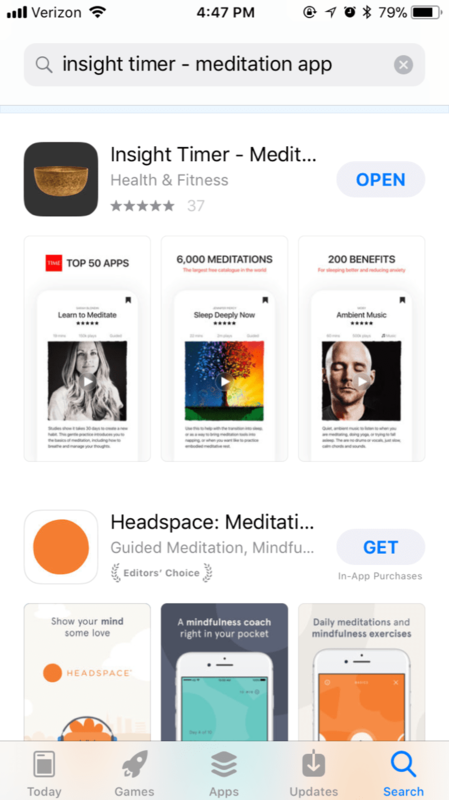 My new morning routine takes less than 20 minutes and in only two weeks I can honestly say I’m living life with more intention, am connecting with my faith more and practicing mindfulness. 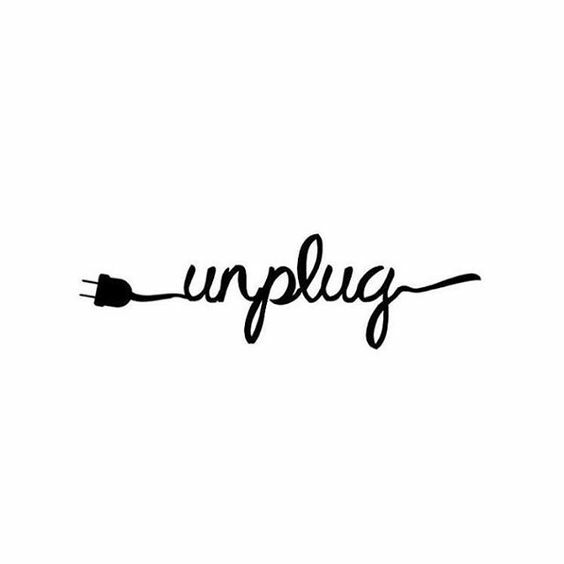 The one other thing we’ve incorporated lately is unplugging at night. Erik and I both noticed that we used to go to bed and be on our phones, not talk and each just do emails, social media, etc. We’ve decided to make our bedroom a phone-free zone and as silly as it sounds, it’s been great! We both are really busy so that extra time together to catch up on our day and really be present with each other is very important. I know it’s only been less than two weeks of my new routine, but I already feel like a different person and am seeing positive changes in my life. It’s crazy how as little as 20 minutes each morning can impact your entire day! What do you do for yourself? Do you have a routine that focuses on you? I’d love to hear! Thanks for making this feel like a safe, supportive place where I can open up and get personal with you! I hope you know you can always do the same! 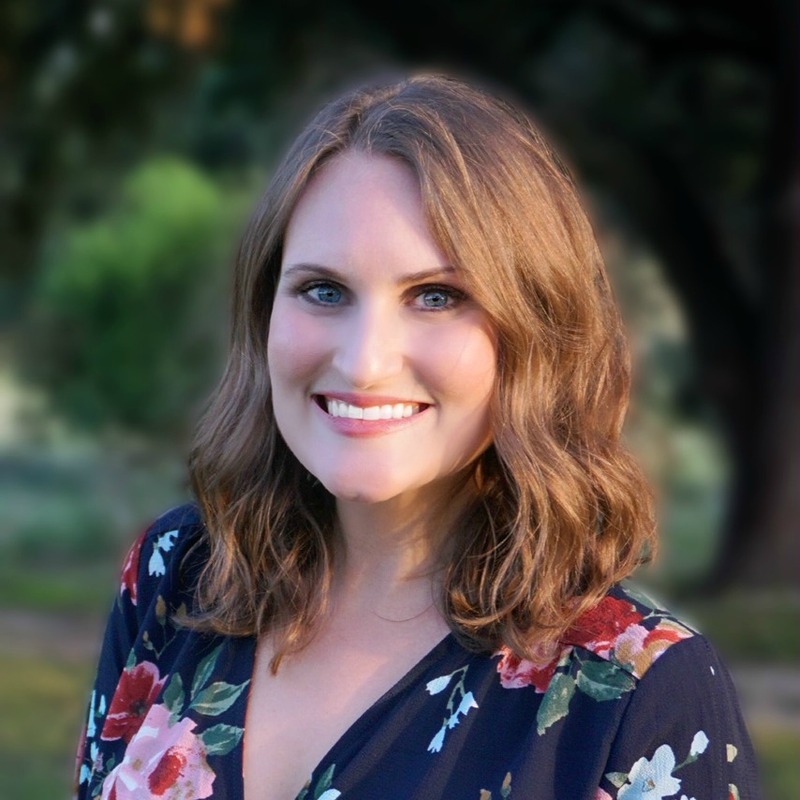 This entry was posted in Lifestyle and tagged Friday Favorites, personal life. 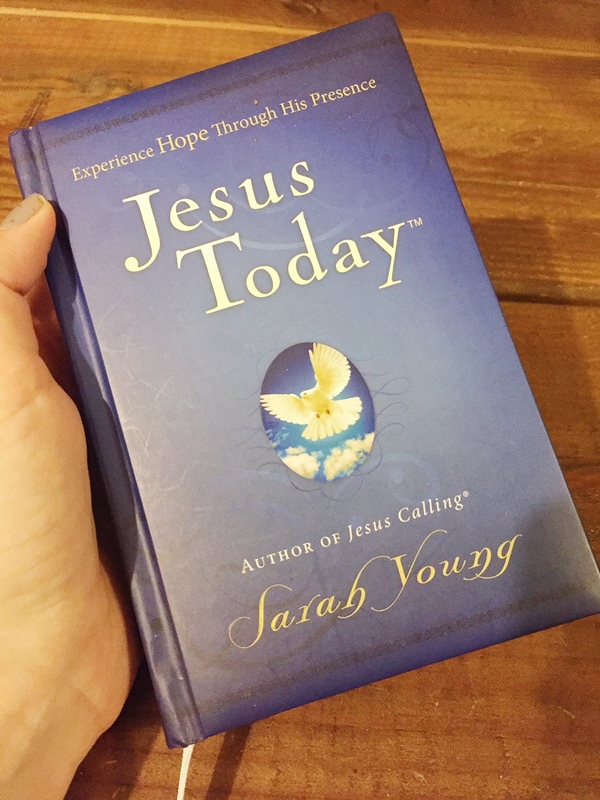 Jesus Today and Jesus Calling are such great books – and great small ways to start each day reminding yourself of God’s promises! I’ve actually brought out Jesus calling again this year (Jesse had my copy last year so we did a swap) as I love it so much. I know, I can read it over and over and still love it!